What is retinol? Chances are you’ve heard of it, perhaps even used it before. But do you know what retinol is, and what it does for your skin? Are you hesitant to try it because you’ve heard of the possibility of harsh side effects? Let’s take a closer look at what retinol is, what it does, dispel some rumors, and figure out if it is right for your skin. Retinol is a derivative of vitamin A—an excellent antioxidant and cell communicator. It works by attaching itself to the skin cells and telling them to act healthy and younger, causing cells to turn over faster, making way for new growth. It also hinders the breakdown of collagen and thickens the deep layer of skin where wrinkles first start, thus making retinol extremely effective in not only decreasing fine lines, but also reducing pore size, improving texture, stimulating collagen production, and also managing acne and discoloration. While many dermatologists agree that retinol is the best age eraser available, it doesn’t come without side effects. For some, retinol can cause the skin to become irritated. This is far more common when using the prescription form of retinol known as Retinoic Acid, Retin-A or Tretinoin, which as you might suspect, is a much higher concentration. Retinol on the other hand is milder and is converted into retinoic acid when absorbed into the skin. One of the reasons retinol products cause less irritation is because of the combination of other ingredients formulated to sooth and hydrate. 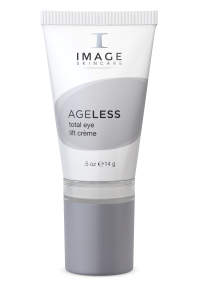 For example, the IMAGE Ageless Total Eye Lift Crème uses retinol combined with green tea, cucumber extract and Echinacea, which are all natural anti-inflammatory ingredients—giving your under eye area all the benefits of retinol, but with less irritation. The Ageless Total Repair Crème blends retinol with AHA exfoliators to repair sun damage and reduce wrinkles, along with Hyaluronic acid to hydrate the skin. Both the Eye and Repair crème are applied nightly, a general rule for all retinol products, as the skin renewal process makes your skin more sensitive to the sun. When deciding if retinol is right for you, it’s important to note that even with the soothing agents, retinol based skincare products can still cause irritation. Often symptoms subside as your skin adjusts, but if the irritation worsens, it’s time to discontinue use and perhaps look into a milder repair line such as Ormedic. Still, it’s hard to dismiss the scientific proven results of this “miracle” product, and it’s well worth checking out the variety of retinol products that Image offers.